Indie-folkers The Parson Red Heads hold down their February Monday residency at McMenamins White Eagle Saloon with Scott McCaughey, Peter Buck, and Marty Marquis, 8:30 PM. 21 and over. Indie rock with The Greater Midwest and The Ro Sham Bos at the Ash Street Saloon, 9:30 PM. 21 and over. Electro-acoustic with Laura Gibson & Ethan Rose at Music Millennium before their album release party at Holocene on Friday, 7 PM. All ages. Just for rockin' at Mixed Social with Parents and The Camerata at the Ash Street Saloon, 9:15 PM. 21 and over. Whiskey stomp, indie folk with The Ascetic Junkies as they continue their February Wednesday residency at LaurelThirst Public House with special guest Sam Cooper of Horse Feathers, 6 PM. 21 and over. Alt-country with Lex Browning at McMenamins White Eagle Saloon, 8:30 PM. 21 and over. Formerly Poncho Luxurio, get your funky jam on with P-LUX and The Way Downs at McMenamins White Eagle Saloon, 8:30 PM. 21 and over. House par-tay at Dekum Manor with rock and nonsense from Cat Stalks Bird, Girls On Da Side, Mustaphamond, and Kotten-dik, 9 PM. All ages. Raw, bluesy rock at LaurelThirst Public House from Woodbrain, 6 PM. 21 and over. 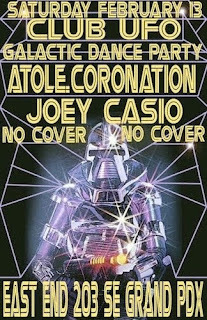 UFO #4 dance, dance, dance party at East End with Atole, Coronation (featuring members of Ra Ra Riot and Plants), and Joey Casio, 9 PM. 21 and over. Nashville acoustic alternative with Dave Rawlings Machine at Music Millennium before his gig at the Roseland, 5 PM. All ages. Acoustic, blues and horns with Gil Reynolds & Deep Blue at McMenamins Edgefield, 5 PM. 21 and over.